After months of teasers and speculation, Andy Rubin’s essential phone has finally been unveiled today. The creator of android is ready with his flagship device with the top-notch outlook paired with one of the best specifications available in the market, to compete with Samsung-Apple oligopoly. This device, first in line of Andy Rubin’s new company – Essential, is more ‘future-proof’ than its contemporaries with its new modular ecosystem, where a large array of mods would be made available soon. The almost bezel less device is made with titanium and ceramic, which overwhelmingly outperforms the aluminium smartphones in the durability test. Showstopper for this new phone is the large screen which covers almost the entire body, wrapping it around the front facing camera emanating a very sophisticated look which even subdues Samsung’s latest flagship galaxy S8. The top back side of the handset houses two magnetic pins that are referred to as “Click” connectors and are used for pairing the Essential Phone with a number of accessories, including the Essential Phone Dock and the 360-degree camera accessory that were unveiled simultaneously with Rubin’s new premium phone. This device is not only outstanding in looks, but boasts top-of-the-line hardware specifications and features including 5.71-inch screen size with a resolution of 2560 x 1312 pixel, aspect ratio of 19:10 and a screen made of gorilla glass 5. The processor inside is Qualcomm Snapdragon 835, Adreno 540 GPU, 4 GB of RAM and 126 GB ROM. The smartphone also satisfies your photography thirst with 13 MP f/1.85 back camera capable of shooting 4K video and front camera of 8 MP with a sensor dedicated monochrome imaging. Usage time would be maximized with a 3040 mAh battery, including type-C USB but it excludes 3.5mm earphone jack. Furthermore, it will have preinstalled Android 7.1.1 Nougat and NFC capabilities. 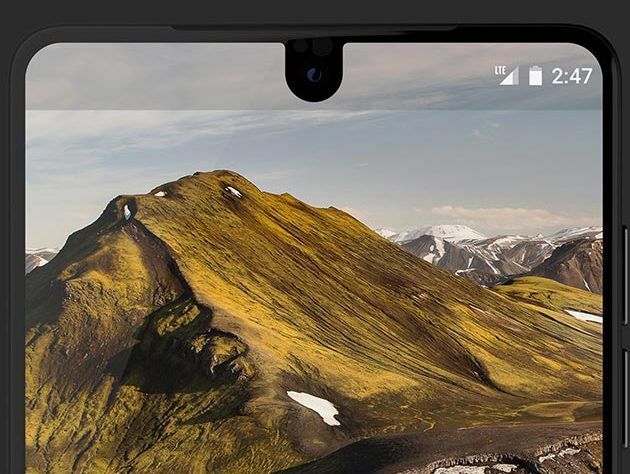 Details of the mods are yet to be announced, but most exciting mod so far is the 360-degree camera which is capable of shooting spherical UHD image (3840 x 1920) at 30 frames per second. In addition, there would be charging dock should you get tired of normal dangling cables. The concept of modular ecosystem is quite similar to Moto Mods, which are additional customizations for the Moto Z line up. Users can choose among four colour variants which are: Black Moon, Stellar Grey, Pure white and ocean depths. The designers have constricted to only essentials to remain in line with the name and disposed of any extraneous junk, even the device does not seem to display any logo of the company and it is hoped that no extraneous software would be laded on to make the performance sluggish. This sophisticated beauty is priced at a moderate range of $699 and is only available in US on pre-order basis, though consumers can pre-order the black and white variant for the time being. Whether this new powerful, clean device sweeps off its contemporaries from the market and gives a tough competition to the mobile giants is yet to be seen. & tech enthusiast whose free time consists of attemps of ditching reality and making a nice, warm bubble for herself. She intensely believes one true love in the world is pizza.